Let me start by saying, I am a girl who gnomes her beer. Let's get to the part you have all been waiting for: the food. This gourmet taco love affair had me at everything is made fresh in house. Meat preparations for select proteins begins up to 48 hours prior to arriving on the plate. Combine this specially prepared meat with a traditional style taco shell and you have all the enjoyment you can ask for. I am proud to report that out of the eight menu tacos (which are creatively named, I might add) I can attest first hand to eating and reviewing seven. They were all delicious. Setting the bar for the taco lineup, you can expect this tender, duck leg meat to give you a sense of melt-in-your-mouth delight. The toppings added to this taco bring little competition to the mildly seasoned duck. Do you like to break a little sweat when you enjoy your food? You’ve found a winner. 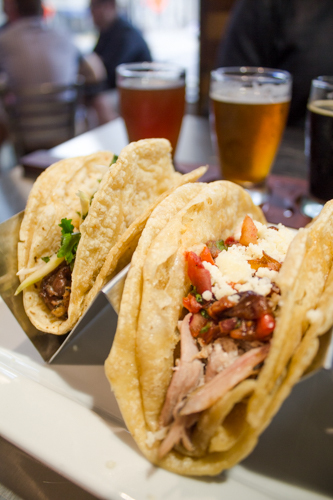 For everyone else, don’t let the heat shy you away from this tasty taco. Fish taco fans, you can rejoice and get excited for this fresh spin on a fish taco classic. Made with togorashi spices, it was a flavor combination foreign to my taste buds, but new tastes don't mean bad tastes. In this case, new tastes were good tastes. Coming in as the number two local pick, I say listen to the people on this one, and be sure to try this taco. The best summation of this taco is a quote from my fellow tasting friend, “Yes, so yes.” My debrief to you before entering this food mission: be prepared for a flavor explosion in your mouth. Dante InfernoFor the person who enjoys a mild pork flavor, this is for you. Still, be prepared for the extra bonus wave of flavors the corn salsa gives. If you’re looking to step up your spicy game, ask for extra hell hot sauce, you’ll thank me later. Pork Belly MonfongoI wasn't sure what to expect when I saw the Pork Belly Monfongo was topped with crispy mashed plantain, being a newbie to the plantain food world. I was delightfully surprised with the texture crunch the little crisps added to contrast yet another tender meat filling. Three Little PigsListen up whiskey lovers, this little number allows the Kentucky whiskey glaze to shine through. The Tabasco spiked sweet potato hay topper adds a pleasant but not overpowering bite, but as all neat drinkers can agree, simplicity offers the opportunity to highlight flavors and nuances. I recommend pairing it with the Urthel Samaranth beer. When looking for something to wash down my tacos, The Hoppy Gnome definitely delivers. 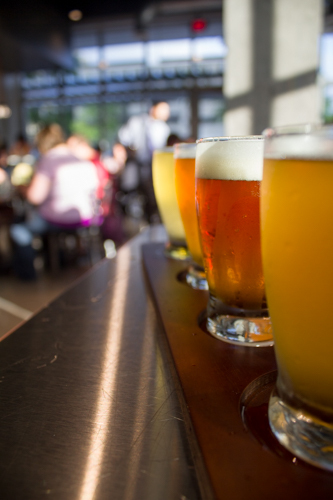 An extensive selection of over 40 beers and 25 wines will not allow you to leave here without your thirst quenched. As a beer lover, I appreciate the time given in the careful selection of areal beers. My only complaint is I couldn't choose just one. This problem was quickly resolved by ordering a flight of testers, a solution I highly recommend. If you're looking for a swanky drink night, head to the Gnome and grab front seats to admire the sunset as it drops behind the courthouse. The window-side tables, of course, offer a clear shot, but truly there isn't a bad seat in the house. Be on the lookout for the outdoor seating to be available off of Berry Street. I'm going to blame my sweet tooth cravings on my need to gain the full experience of The Hoppy Gnome, and as I sit here with my food baby, I have no remorse. The S'mores dessert features in-house made marshmallows, dark chocolate bark, and graham crackers. It definitely elevated my taste for my favorite campfire dessert. Oh, and you get your own personal flame to roast your marshmallows over. Yep. Definition: glamping. I didn't expect to be roasting marshmallows on my night out in downtown Fort Wayne. 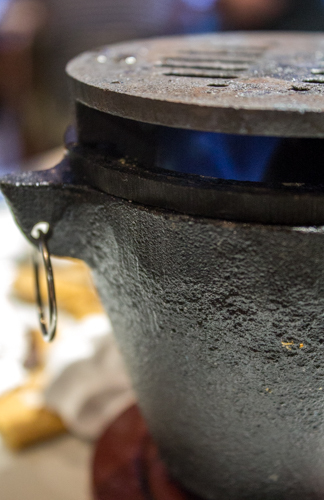 Each plate is paired with a miniature, cast iron, stern fueled fire pit and roasting prong. Hats off to you, Hoppy Gnome, for this fun creation. Don't overlook the second dessert, the strawberry shortcake, beautifully presented in a jar overflowing with macerated strawberries, chantilly cream, and shortbread cookie crumbles. I won't give away a zesty topping not listed on the menu, but I will promise it gives an excellent oomph to the dish and is yet another example of how The Hoppy Gnome pays attention to the details. Closing my review on The Hoppy Gnome, I have to mention the excellent service I received. The food was delivered crazy fast! I had barely tasted my beer before I had a plate of tacos in front of me. As far as pleasant company, thank you to James, Pete, and Rebecca for your hospitality, and a special shoutout to my server Samantha (Sam) who happily answered all my questions with ease. After this successful first impression, you gnome I will be dining here again (okay, I lied, one more pun). Be sure to give The Hoppy Gnome some social love by following them on Facebook, Instagram and Twitter.